1. Brown roast in Dutch oven or 6-quart saucepot over medium-high heat. Add Lipton® Recipe Secrets® Onion Soup Mix blended with 2 cups water. Bring to a boil over high heat. Reduce heat to low and simmer covered, turning roast occasionally, 2 hours. 2. 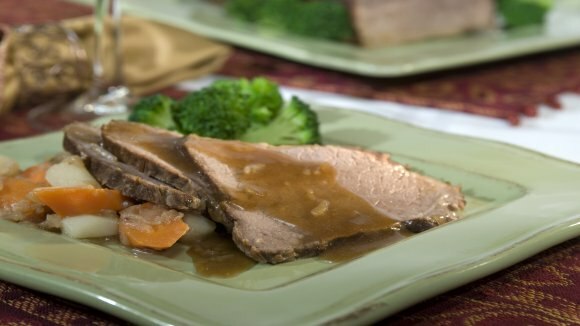 Add vegetables and cook an additional 30 minutes or until vegetables and roast are tender; remove roast and vegetables. 3. For gravy, blend remaining 1/2 cup water with flour; stir into Dutch oven. Bring to a boil over high heat. Reduce heat to low and simmer uncovered, stirring constantly, until thickened, about 5 minutes.